Aviva Enterprises Inc., 1972. 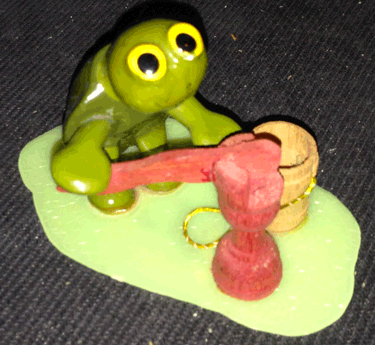 Freddy B Turtle Hand Crafted Polymer Figurine. 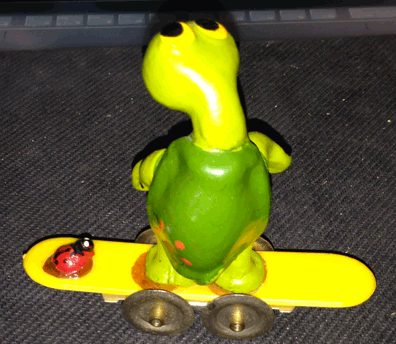 This little turtle stands just over 3 inches tall and about an inch wide. 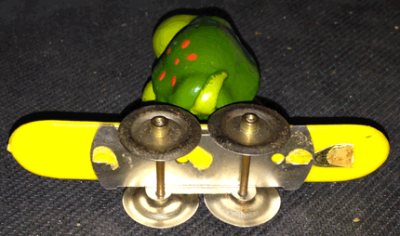 The skateboard is about 3.5 inches long. It weighs 1.2 oz. This turtle looks to be painted; he has yellow eyes with black pupils. 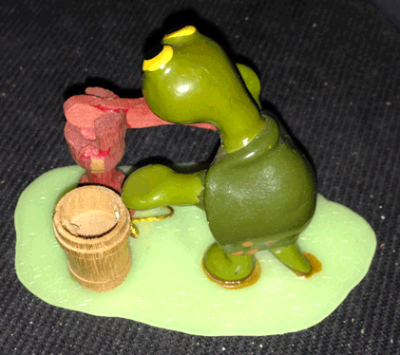 His body is green while the head, feet and tail are a light green. An orangey-red flower is dotted onto the back of the shell. He has a very faint trace of a smile. The ladybug is painted black and red with white dots for eyes. 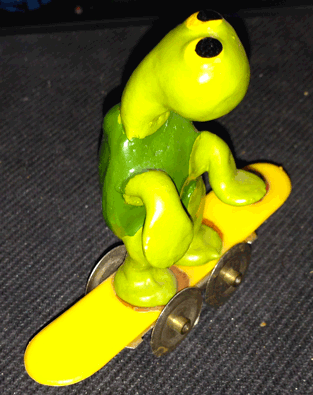 The skateboard is a piece of solid yellow plastic. 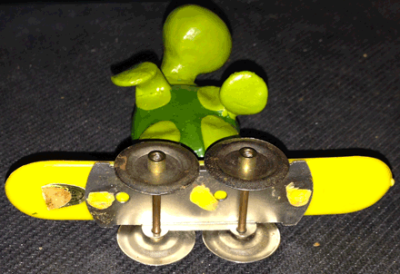 The glue looks to have darkened over time and one of the wheels has developed a little rust. There is a gold sticker attached to the bottom of the skateboard with the maker's information and date. 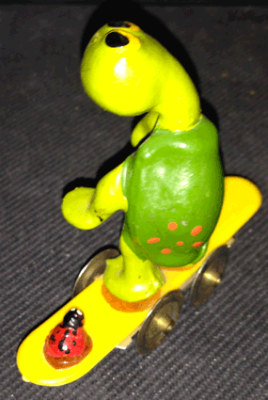 This little turtle is a collectible, over 30 years old. Aviva Enterprises Inc., 1972. 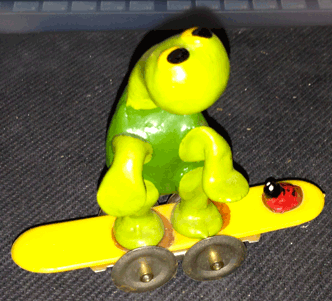 Freddy B Turtle Hand Crafted Polymer Figurine. 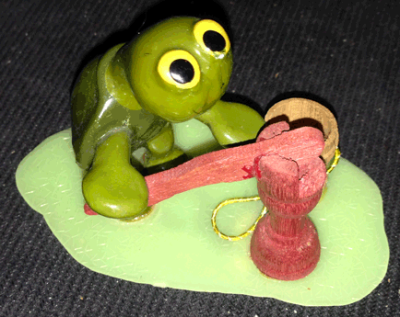 This little turtle stand 2.25 inches high and measures 3.5 inches long at the base. It's about 2 inches wide. It weighs 1 oz. This turtle looks to be painted; he has yello eyes with black pupils - his right eye has a defect at the base of it that shows up in the pictures. two tiny black dots make his nose and a long thin black line paints his smiling mouth. 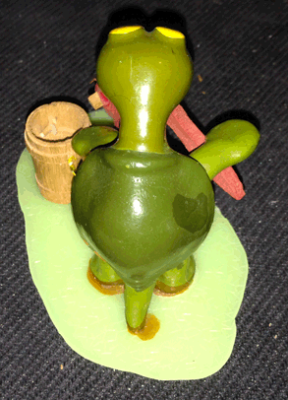 His body is green with his head, feet and tail a lighter shade of green. An orange flower is dotten on to the back of the shell. 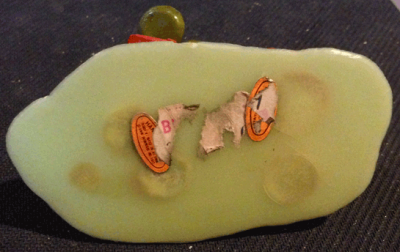 There is also a blotch of darker green paint on the right side of the shell. The glue attaching it to the base appears to have darkened over time. 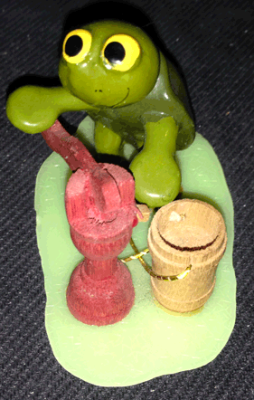 There is also a red wooden hand pump and an unpainted wooden bucket attached to the figurine. The buckey has a shiny golden string attached to it for the handle. The base is a piece of stiff, light green plastice with a grassy textured surface. There are 2 gold stickers attached to the bottom of the base, both have been obscured by a store sticker that was placed overtop. The information is still readable. This little figurine is in good condition and has no defects that it didn't come with originally. It is over 30 years old, and a collectible.